If you have reached a point in your relationship where either yourself or your partner feels they cannot continue, you will need to sit down and talk about it. Whether you are uncertain about breaking up, have decided and want to discuss the underlying emotional issues, or need to go through the practical details, calm and open discussion will help. There are no rules that say when a couple should break up or not. Everyone has lines that, once crossed, make it clear to them the relationship has to end. Sometimes the lines will keep moving ahead, making it harder to come to a decision. Your partner may have been abusive, and you may decide this is forgivable. They could then decide to end the relationship. You might beg and plead with them to stay in order to save the marriage, or for the sake of your children. But at a certain point they will cross a line and you will then have to switch to focusing on how to survive the inevitable separation. If the relationship looks like it is going to end, get clear on where your boundaries are. Also realise that if there are emotional issues that can be addressed and changed within the relationship, these may take time to get through. Relationships go through rough patches that can go on for months and even years without the couple separating. Before you talk to your partner, get clear on what you feel are the issues affecting the relationship. Talk about your feelings and needs. Do not simply write a catalogue of complaints. If you think there is a chance you could get back together in the future, tell them. If not, make that clear. You may also want to find out your legal position and the practicalities of the process in advance. The most important thing to remember when talking to your partner about divorce is to be honest. Being open and honest from the outset sets a precedent for future discussions and also makes the whole process a lot less traumatic and painful. Tell your partner that you want to separate, explain the reasons why and give them time to respond. 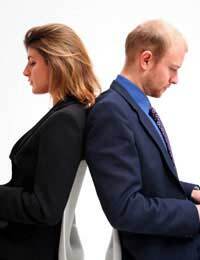 If possible, arrange a time to sit down with your partner and talk through the issues. Give each other time to say what you feel without interruption. Then allow your partner to respond. If you can, avoid blaming each other and make an effort to listen properly, both partners will feel that their emotions have been recognised and it can be very gratifying. It can also be painful, hard and you may not get what you want. If you find it hard to talk to each other, you might need a forum where a neutral third party listens and makes suggestions. Counsellors and some psychotherapists are trained to deal with couples at various stages in their relationship. They can be helpful in terms of pinning down the issues and working out strategies to deal with them. Before you visit a counsellor, work out in advance what you think the issues are. The process can go on for weeks or months, so realise you do not have to solve everything in the first session. The counsellor may uncover deep-seated behaviour patterns that will have to be changed for the relationship to survive. Working through these problems, whether in counselling or not, is a real challenge and requires commitment. Seeing a counsellor one-to-one can also assist you with how to talk to your partner about divorce, or help clarify the emotional issues. Relationship guidance counsellors can also offer advice on the practicalities of separation, and provide ongoing support for individuals in the process of breaking up. Look up Counsellors in your Yellow Pages or visit the British Association for Counselling and Psychotherapy web site for more information. At some point you will probably want to talk with your partner about the practical effects of your divorce. Division of property and money, custody and childcare issues are important and can be stressful to talk about. If you are fighting with your partner it can make it very hard to get through these issues. Maintaining a calm and open attitude will make the process less complicated. You may want to talk to a lawyer first to clarify your position. From issues such as property and child custody to pension rights and insurance, a lawyer can help you get clear on how the process will affect you and your partner as you move forward.